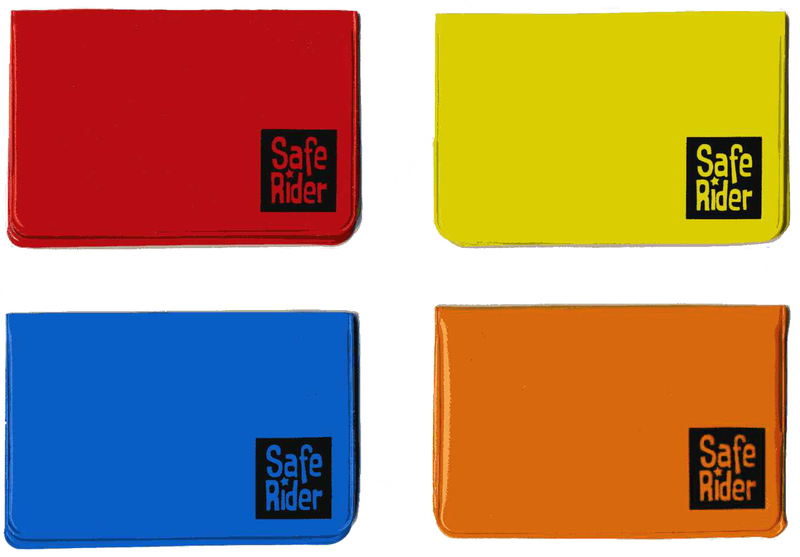 Stringbean Design was approached by the BCSA to help develop an Education and Outreach program to help reduce accidents in and around the passenger rail system which spans Metro Vancouver. One of the particular challenges we faced was that the demographics of the ridership spans all cultures, education levels, languages and literacy proficiency. The existing English text campaign that Translink uses leaves out a majority of riders. Another challenge we faced is the lack of available space to display the BCSA Passenger rail safety messages within the stations or in the vehicles, due to cost. 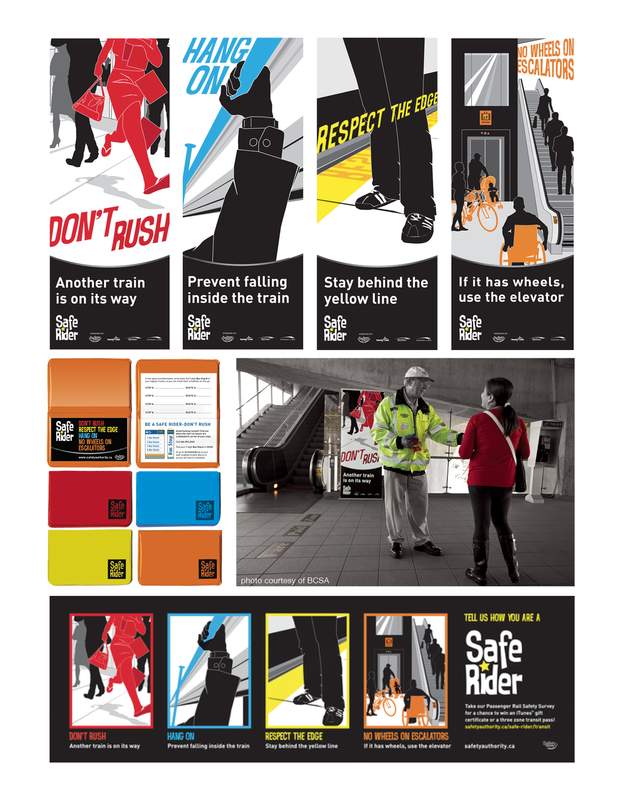 The solution we came up with was to employ strong, graphic visuals which could be interpreted without reading the text. Since the cost of placing permanent posters or displays was too cost prohibitive, we provided the client with 7 foot tall, retractable portable banner displays that could be brought in by the BCSA Safety Officer for in-station outreach events. The BCSA was provided with "swag" to hand out and further engage passengers as they made their way through the station. This swag took the form of these protective bus-pass holders, which contain a printed insert which allows passengers to write down their regular bus stop numbers, enabling them to call or text ahead to Translink's "Next Bus" service to find out when the next bus was scheduled. Knowing when the next bus is scheduled to arrive helps riders to eliminate the feeling of having to rush – rushing is the number one cause of in-station accidents. A series of ads were placed in the Metro and 24 Hour newspapers that are handed out to riders at most Skytrain stations. The purpose of the ads were to invite riders to participate in a survey, which would help test rider knowledge of passenger rail safety before, during and after the outreach events. This would help give the BCSA vital feedback on the effectiveness of the message and the medium. Recently, the BCSA invested in skytrain ads, which appear at eye-level along the interior sides of the trains. 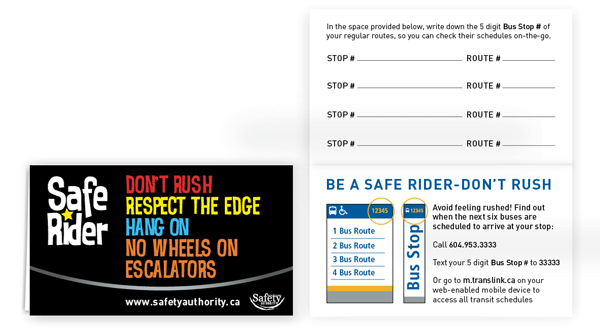 The skytrain ads deliver the safety message and invite riders to provide feedback and engage with the BCSA on the web.